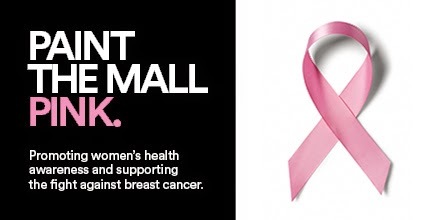 ATLANTA – To celebrate women’s health and promote Breast Cancer Awareness Month, Mall of Georgia and Town Center at Cobb are hosting their third annual Paint the Mall Pink from October 2-5. The community events are set to be filled with fun and informational activities, prize giveaways, entertainment and more – all while benefitting breast cancer research. Support Breast Cancer Awareness month with special 5K races, fashion shows, live music and much more! Thursday, October 2 from 6 - 8 p.m. Calling all fashionistas! Grab the gals and get in on all the mini makeovers, swag bag giveaways, fun prizes and more! Guests can also enjoy live entertainment from local favorite, The Woody’s Unplugged. For more information, please visit on.fb.me/1rwcu1j. Sunday, October 5 at 8 a.m. and 9 a.m.
Lace up the tennis shoes and head on over to Mall of Georgia for the third annual Great Gwinnett Road Run! Runners and walkers of all levels are invited to a fun-filled morning of exercise, benefitting the Georgia Breast Cancer Coalition and family of Alyssa Tucker, a 10-year-old Buford girl who was recently diagnosed with sarcoma, a rare form of soft tissue cancer. The 5K begins at 8 a.m. and the Fun Run kicks off at 9 a.m. For more information on tickets, registration and more, please visit bit.ly/1u3mgc2. In honor of Paint the Mall Pink Weekend, Town Center at Cobb is hosting a pink window display contest throughout the mall from October 2-5. Participating stores will have pink window displays. Photos of each store will be placed in an album on Town Center at Cobb’s Facebook page on Thursday, October 2. Shoppers can vote for their favorite display by taking a photo of the store window with the hashtag #TCCpink and uploading to Instagram and Twitter. These votes will also be combined with the number of Likes, Shares and Comments each store photo receives from the Facebook album. The contest ends at 6 p.m. on Sunday, October 5. Stores in Town Center at Cobb will also be showing their support with pink ribbons on their storefronts, and many will have in-store promotions and events during the month as well. For more information, please visit on.fb.me/1CtR5sN. Thursday, October 2 from 5:30 – 8:30 p.m.
Town Center at Cobb and WellStar invite sisters, daughters, moms, aunts, grandmothers and girlfriends to put on their favorite black dress or stylish attire for the third annual Spirit Girls' Night Out! This fun-filled evening, themed The little Black Dress, will focus on two daily essentials in any woman's life – fashion and good health! The event will feature FREE health screenings and information booths from WellStar, complimentary goody bags (for first 300 guests) door prizes, beauty and styling demonstrations and a fashion show featuring the latest trends. For more information, please visit on.fb.me/1rplAez. Saturday, October 4 at 11:55 p.m.
As part of its Paint the Mall Pink Weekend, Town Center at Cobb is hosting a “Glow the Mall Pink Midnight Madness 5k!” Runner and walkers are invited to glow the night away with non-stop entertainment on the course and a huge after-party featuring great music, dancing, food and more! There will even be a virtual "pink out" with pink lights and effects as well as a special pink carpet. For more information on registration, please visit http://bit.ly/1qzb8NV. Shoppers are encouraged to put on their best pink attire during “PINK OUT” on Saturday, October 4 in support of Breast Cancer Awareness Month and Paint the Mall Pink weekend. Shoppers can also head over to Center Court from 2 – 6 p.m. for FREE health screenings courtesy of WellStar. They will also have flu shots available for a fee. COST: Paint the Mall Pink events are FREE (excluding race participation fees). For more information on these events at Mall of Georgia and Town Center at Cobb, please visit facebook.com/TownCenterAtCobb and facebook.com/MallofGeorgia.